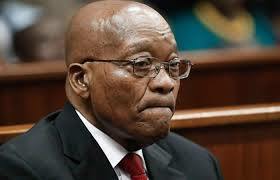 South Africa’s former president Jacob Zuma appeared in court Friday over a $2.5-billion (2.15-billion-euro) corruption case linked to a 1990s arms deal, but the judge adjourned the case until the end of November. Zuma, who was forced to resign in February, has been charged with 16 counts of fraud, racketeering and money laundering relating to an arms deal before he took office. Zuma, 76, is one of the rare former African leaders facing trial after his ousting. The ruling ANC party stalwart has made two earlier appearances in the court, located in his homeland in KwaZulu-Natal province where he commands huge support, but this was his first court hearing with a new legal team. Zuma is accused of taking bribes from French arms company Thales during his time as a provincial economy minister and later as deputy ANC president. Judge Madondo delivered a stern reminder to Zuma, saying he should not think of shunning future court proceedings. A separate inquiry into the Zuma government’s alleged corrupt dealings with the Gupta business family will begin on August 20, the inquiry head announced Friday.